Back to Charles II. Although he had no legitimate heirs, he did sire a dozen little bastards. Many of them received duchies or earldoms just as consolation prizes. Eventually, however, what goes around comes around; that is, the late Diana, Princess of Wales, was descended from one of Charles’ children. If her son, William, ever becomes king, he will be descended from Charles II and, thus, be a Stuart. I think. But am not sure. And don’t really care. Some of what went around may, however, have come around to Naples, of all places. At an early age Charles II apparently had an illegitimate child (probably his first) in 1646 (precocious!) by a noble lady on the island of Jersey. That son was educated in France under the name of James de la Cloche du Bourg. Charles apparently acknowledged his paternity and provided money for his son, under the provision that James reside in London and that he not forsake the Protestant faith. James, however, became a Catholic and entered a monastery in Rome in 1668. Shortly thereafter, with the hope of finally achieving public recognition as the son of Charles and obtaining whatever might accrue to him as birthright, he traveled to England. There is a brief period of silence in known documentation, after which, in March 1669, one James Stuart, claiming to be our James de la Cloche du Bourg shows up in Naples. He is no longer a monk, but is decked out regally and has papers to back up his claim, including letters from Charles. Most who have written about this—including others not listed in the bibliography (below)—think he was a fake and that his papers were forgeries. Steuart (1903) thinks he was authentic. Whatever the case, it is moot, since Charles’ other “eldest son,” James Crofts, had already been recognized as such, and Don Jacopo Stuardo, as he was called in Naples, was left to his own devices. He, whoever he was, married one Teresa Corona in February of 1669 in the chapel of S. Aspremo in the Naples Cathedral. James roused suspicion by his boasting and the Spanish viceroy had him locked up in Gaeta and then in the horrible prison of the Vicaria in Naples. His wife, apparently related to the noble Orsini family, managed to get him sprung. He died in Naples in August, 1669. He left a son, James, who married Lucia Minelli di Riccia in 1711. On March 30, 1726, this son obtained a certificate from Cardinal Pignatelli in Naples recognizing him as prince Don Giacomo Stuardo, the posthumous heir of Don Jacopo Enrico di Bove Stuardo, Filius Naturalis Caroli Secondi Regis Angliae [natural son of Charles II, king of England]. Son James fell into troubles in his life, including prison in Naples, though he eventually did manage to have some of his father’s estate returned. There is a letter apparently written by James from the year 1752. After that, he disappears. Apparently he left no children. “The Eldest Son of Charles II,” Westminster Review, 6 February 1903. Steuart, A. Francis. 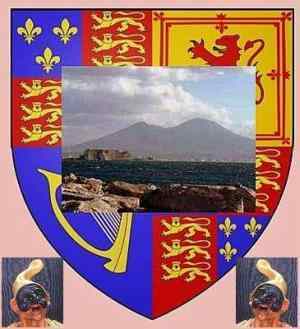 “The Neapolitan Stuarts” in The English Historical Review, Vol. 18, no. 71 (July 1903).